In “The Vanishing Trail – Part 1” in last fall’s edition of the Pathfinder, I shared some background on the historic route traversing the Blaeberry River valley in British Columbia and the Howse River valley in Alberta. 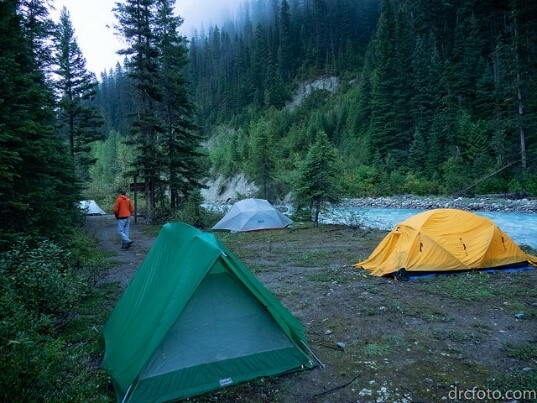 Known today as the David Thompson Heritage Trail, the backcountry path constitutes an essential link in the Great Divide Trail between Yoho and Banff National Parks. Or at least it should – if it were possible to follow it! For many years the trail has been completely overgrown, blocked by innumerable fallen trees, and washed away in places by flooding. 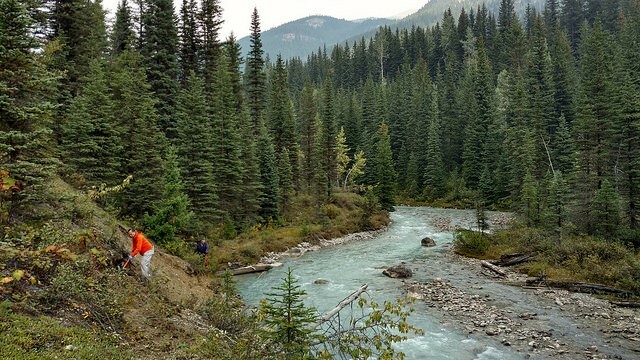 In early 2018, however, our organization signed a partnership agreement with Recreation Sites and Trails BC, under which the GDTA assumes stewardship of this important route. 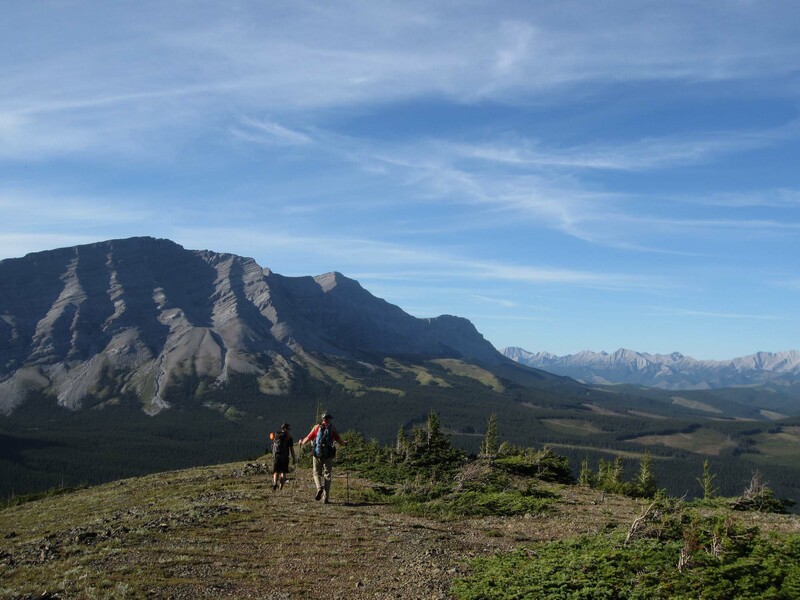 Although the agreement covers only 13 km on the western side of the Divide, this portion of the David Thompson Heritage Trail has been arguably the most challenging and frustrating for hikers. With the “wheels” thus set in motion, the proverbial i’s dotted and the t’s crossed, an official work trip was scheduled for late summer, the author’s arm having been firmly twisted to serve as crew leader. 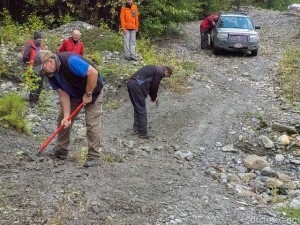 Vehicle access to the trailhead at Cairnes Creek, 65 road kilometres north of Golden, has been cut off for several years by washouts along the Blaeberry River, adding a tedious and often treacherous slog of 14 km for anyone hoping to reach the trail. 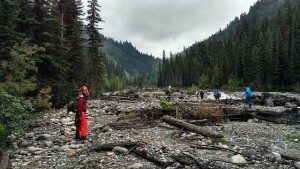 In mid-summer, though, forest company Canfor began repairing the road, bypassing washed-out sections with new construction and installing bridges. This enabled me and my son Andrew, riding dual-sport motorcycles, to reach Cairnes Creek on the weekend of August 20-22nd to carry out reconnaissance ahead of the upcoming work trip – and answer the most important question: could we get four-wheeled vehicles all the way to the trailhead, over the partially-repaired road? The answer, we concluded, was yes – provided it didn’t rain and turn the construction zones into a quagmire! 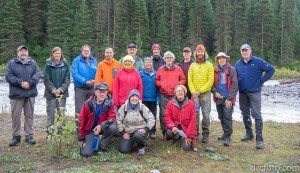 We also hiked – or more accurately thrashed our way – along the entire 13 km to Howse Pass and return, taking sober note of the sheer volume of work facing the incoming GDTA crew in just over a week’s time. Fast-forward to the early afternoon of August 30th; seven sturdy vehicles loaded with gear and 14 eager people from Alberta, BC and California were making their way up the Blaeberry valley in – you guessed it – a light but steady rain. Reaching the first of 3 washout bypasses, we were greeted by what can only be described of a sea of deep, gooey muck coating the entire unfinished right-of-way for the next 2 kilometers. After determining that only 4WD had any prospect of success, two vehicles were parked and five proceeded without incident. The next bypass featured a steep, slick down-and-up crossing of a temporary bridge, which by some miracle combined with superhuman driving skill, slowed but failed to halt our progress. 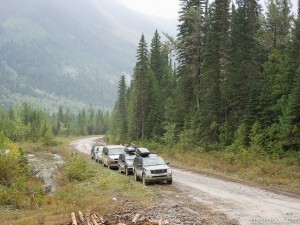 But the final detour began with an abrupt, nasty uphill that in another setting might have sported a sign with a black diamond symbol and a name like “Widowmaker Gulch.” This, and the thick mud, proved too much for another of our mounts, so now we had the gear and passengers of 7 vehicles crammed into four, for the final 6 km to our objective. But the fun wasn’t over yet. Ahead, beyond the end of construction, the roadway was buried by two long-ish sections of rock-and-gravel alluvial wash, forcing us to invest a few hours of pick-and-shovel work to smooth the high and low spots and allow safe passage. All with no letup in the rain! Our soggy caravan finally splashed into the long-abandoned Cairnes Creek forest recreation site at 7 pm, with only an hour of poor light left to set up tents and our big, much-needed camp shelter. Everyone felt the next 3 days of trail work would be a piece of cake after dealing with the road! Later that evening another volunteer, John Courtney of Quesnel, magically appeared in camp, to be followed the next day by Doug Borthwick from the Okanagan, making for a nice even 16-strong crew. And what an amazing crew it proved to be! The lofty goal set out for us was complete rehabilitation of the first 8 km of the David Thompson Heritage Trail from Cairnes to Lambe Creek. 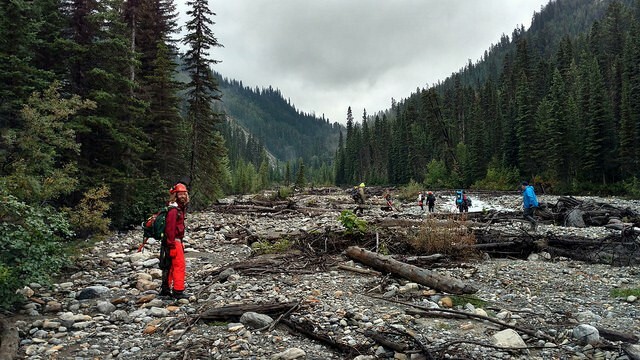 To make this happen we had to reroute the trail in no less than 8 places where the river had washed it away, cut through literally hundreds of blowdowns, build new tread, and most significantly, remove the vast amount of undergrowth choking the trail throughout. 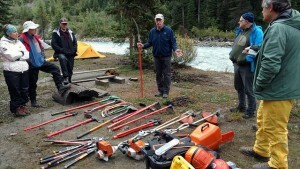 It was extremely fortunate that we’d brought gas-powered brushers and especially people like Robert Armstrong, Julien Cossette and Doug Borthwick who knew how to use them, not to mention swamper extraordinaire Debbie Yanchula who must have dragged a ton of cuttings off into the bush to preserve the aesthetics of the trail. Jenny Feick, an original GDTA founder, and Ian Hatter, both of Victoria, were invaluable not only for their attention to detail but also their extensive knowledge of the flora and fauna. Jenny recognized the unique character of the Blaeberry valley: it contains many plants and trees not normally found in the Rockies, rather in the Columbia or coastal mountain ranges, such as Western Red Cedar, Western Yew, and the diabolical Devil’s Club. And speaking of expertise, new volunteer David Crowe’s photographic skills were highly prized – but perhaps not as immediately as his familiarity with wild berries, the downside being very few were left behind for the resident bear population! Huge thanks also to our new friend John Courtney, our one-and-only chainsaw operator without whose equipment, skills, energy and hard work we would never have come close to accomplishing our task. Prize for the longest commute to the work site goes hands-down to Joan Pendleton from the bay area in California (OK, so she was also doing some hiking in Jasper!). A great addition to the team nonetheless. Rounding out the balance of the crew (in alpha order), we had Bert Barlaan, Jeremy Bateson, Gail and Alistair Des Moulins and George Springer; all talented, positive, and highly motivated volunteers who were able to identify needs and very capably deal with them. Finally, a big appreciative salute to GDTA veteran Lani Smith, who not only expertly stick-handled latrine setup and camp management, but single-handedly filtered hundreds of litres of river water for everyone’s use. And his eternally cheerful disposition will always be a welcome addition to our camps. Happily as well, the weather mostly cooperated for our three work days, with only very light intermittent showers but cool (+10C) daytime temperatures. Preferable, everyone agreed, to the sweltering heat we’re often treated to on our July signature trips! And the only injury sustained, not counting Julien’s minor avocado-hand incident (if you don’t know what that is, just ask any millennial), was a wasp sting – to the trip leader of all people, who inadvertently disturbed a nest in a rotted log while dragging alder cuttings off the trail. At the end of the last day’s toil, after a short break to admire the scenic Lambe Creek canyon, the crew began making their way back along the newly-restored trail. It was immensely satisfying to experience the results of our efforts first-hand, not only from the perspective of hikers who would no longer have to laboriously route-find their way through the valley, but also in the knowledge that we accomplished the task set out for us in a first-rate manner, and a nationally significant historic resource was now well on the way to being fully restored. There was much discussion in favour of returning in 2019 to complete the restoration on the final 5 km to Howse Pass. After dinner, a succinct text message went out from our Spot device to the GDTA leadership: “Mission Accomplished!” Then, as if unwilling to allow us any further consideration, the sky clouded over and a steady rain began to fall, continuing through the night and causing the trip leader to lose no small amount of sleep over the ability of our vehicles to make it through what would likely be an even worse sea of mud at the road construction sites. But the rain stopped during breakfast, allowing camp to be struck and packed up by 10 am, and we set off in convoy. As it turned out, travelling generally downhill made all the difference and no one got stuck. The remainder of our journey home was without incident, although minor repairs and major cleaning were in store for all the vehicles! I’m sure I speak for everyone involved when I say it was a great privilege and an honour to be invited to participate in the rehabilitation of this very special trail. 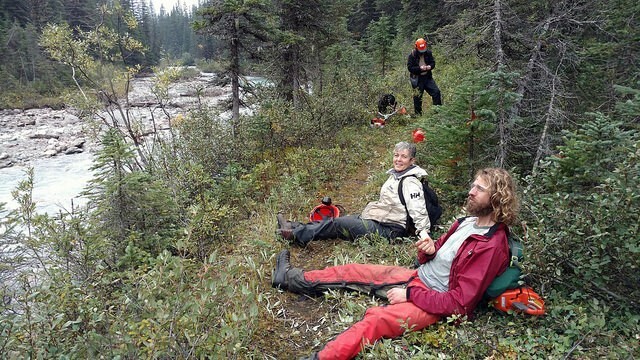 We all look forward to not only completing the job on the BC side of Howse Pass but hopefully to be able to work with Parks Canada to re-open their portion of the extraordinary, no longer vanishing, David Thompson Heritage Trail.